Whether it's Egyptian mummies, Samurai warriors or the indigenous (yet no less exotic!) 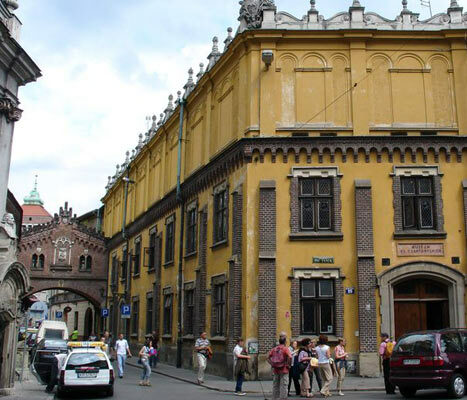 winged horsemen, all can be tracked down at one or another of Cracow's museums. There are also some fine collections of paintings about town, especially at the National Museum, but you can also find a few gems in the upstairs gallery of the Cloth Hall. Generally, museums are open every day apart from Mondays, and the great majority offer free access on Sundays. One slight pain though is that throughout the week most shut up shop promptly at 3 pm, so it's worth planning ahead to avoid disappointments. The Old Town is positively choc-a-bloc with museums, ranging from the venerable Czartoryski Museum, Poland's oldest foundation of this kind, to the quaint Pharmacy museum on ulica Florianska. Over the river from Wawel Hill, you will find the rather special Manggha Japanese Centre, which was built under the aegis of the film director, Andrzej Wajda. Here you can immerse yourself in oriental style, rounding things off with a cup of green tea and a tremendous view of the castle. Another short walk from the Old Town, yet still within the City Centre, takes you to the main branch of the National Museum. It's just around the corner from the Jagiellonian University Library, which houses many ancient relics. Kazimierz, the former Jewish district, is also host to some important collections, particularly the Jewish History museum in the Old Synagogue. There is also a moving museum of the ghetto just over the bridge in Podgorze. This collection is housed in the former home of Pope John Paul II, whose apartments ('skis and all') have been fondly recreated as a part of the display. Important churchmen have lived on this street since time immemorial - hence its name (street of the canons) and the power of the church is well-reflected in the splendour its buildings and in the regalia on display in the museum itself. A distinguished collection of mummies can be found in this romantic old building that served variously as a palace, a monastery, a prison and now a museum. There's plenty to venerate here, not least the statue of the pagan God Swiatowid, which was found miraculously at the bottom of the River Zbrucz. An historic collection of late eighteeenth and nineteenth century Polish paintings. In need of an overhaul but still worth it for several gems including Witkiewicz's High Wind in the Tatras and Piotr Michalowski's Somosierra Pass. And the Cloth Hall itself is a wonderful building. A rare jewel of a museum with an extraordinary history to match. Famous of course for its Leonardo da Vinci, but there is much more besides this. One of the most evocative places in the city. Discover how the Cracovian bourgeouisie lived in times gone by in this charming little museum of interiors. Perhaps due a breath of fresh air but there are some interesting bits and bobs here, not least a vast model of the city as it was in medieval times. Dedicated to a towering figure in Polish art. The backroom and stairs are a little morose, and could be livened up considerably if funds were found. However, by and large this is a delightful museum thats well worth a visit - its very much a Cracow classic. Matejko (1838-1893) was a dynamic figure in the arts, and his legacy can be enjoyed across the city, in church murals, sweeping historic paintings and more. He lived in this splendid old townhouse, which contains many original furnishings as well as a fine collection of his art. Worth keeping an eye out for one-off exhibitions. Founded in 1946 and part of the Jagiellonian University, the Pharmacy Museum is one of the few museums of that type in the world. Exhibits collected here show the history of pharmacy from the Middle Ages to modern times. An eighteenth-century pharmacy has been reconstructed inside, as well as some other interiors - like an old laboratory, an apothecary cellar with barrels and flasks for medicinal wines, and an apothecary attic for drying and storing herbs. The museum also houses a library preserving old herbals, antidotaria, pharmacopoeias and other old prints relating to the history of the art of preparing drugs. Besides the small exhibition of municipal treasures the tower is also well worth a visit for the splendid panorama of the Rynek, which is never a dull sight to behold. A fascinating collection of work relating to one one of Poland's finest sons, Stanislas Wyspianski. Wyspianski was a Renaissance man if ever there was one - he could turn his hand to poetry, play-writing, painting, stained-glass, costume design, furniture design - a sparkling genius to be sure. Founded in 1364, the Jagiellonian is second only to Prague as the oldest university in central Europe. Within these hallowed rooms history is everpresent, and there are some fine objects on display. These include some rather amazing globes and sceptres. Treasures were consistently handed down through the centuries by kings, grandees and eccentrics alike and there's much to savour. A delightful museum dedicated to a prominent figure in the Arts, Jozef Mehoffer (1869-1946). Mehoffer excelled as a painter, and even more so in stained glass. He lived in this house for many years, which remains largely as it was in his time. An enchanting glimpse of a lost world. A very pleasant afternoon can be spent here at the Manggha centre. This sleek new building, with its fantastic riverside setting, provides a modern interpretation of traditional Japanese architecture. A major project, it was created by the film director Andrzej Wajda, who has given a permanent home to the collection of a lively figure in the arts one hundred years ago - Feliks 'Manggha' Jasienski. There are some exquisite things here, ranging from silk paintings to samurai armour and a number of prints by Hiroshige. An enchanting longbow and quiver seem tailor-made for a Japanese Robin Hood. Don't miss Cafe Manggha with its wonderful view. This slightly forbidding looking building, which was put up in the 1930's, is the main headquarters of the National Museum. Don't be put off by looks though, as there are some great one-off exhibitions here and the permanent collection of late nineteenth and twentieth century Polish painting recently reopened after renovation. A sobering museum that chronicles the suffering of Poles during the Second World War. The Gestapo used this building to imprison and torture Poles and the cells remain as a testament to this appalling era. The Cathedral has ammassed some unique treasures over the centuries, and here you can have a peak at some of the most intriguing. Relics such as the head of St. Stanislas (which is sealed in a bejeweled box that was given to Poland by Elizabeth of Habsburg) are amongst the most sacred in Poland. Take a journey back to the dawn of christianity in Poland where you can find the best preserved pre-Romanesque church in the country. An archaeologist's delight. A small exhibition of oriental wonders, much of it booty that was abandoned by the Turks when they fled from Vienna in 1683. Plenty of sword-hacking entertainment for schoolboys with an eye for swashbuckling antics. Also some mythic ceremonial regalia. Once the nerve centre of one of Europe's greatest powers. Many splendid tapestries on show amongst many other treasures. A tremendous addition to Cracow's Museums and to Kazimierz itself. This splendidly-renovated building is dedicated to shedding light on the legacy of Poland's Jews - more specifically on the lost world of Galicia (the huge Southern province of which Cracow was the second city). Exhibitions, workshops and lectures look sure to make this a rich fixture in Cracow's cultural life. An added bonus is that this is one of the only museums in town to maintain consistently good opening hours: 10am - 7pm, seven days a week. This is one more reason to head down to Kazimierz - a district that is often overlooked. Housed in an impressive old building that had been the Town Hall in Renaissance times, it now blooms with vibrant folk interiors and art. A typical such interior was recently featured on the cover of 'World of Interiors' magazine, so perhaps this is the place to come if you're a budding young designer! Inside the Old Synagogue, which is itself a highly evocative building. The museum contains a number of exhibits that introduce the traditions of Polish Judaism. Upstairs there is a straightforward and shocking chronicle of the fate of Krakow's Jews in the Second World War. The location of the museum renders it all the more powerful. Check out this small, local museum for interesting tidbits about the history of this part of town. The pride and joy: A sweet, coat of arms - laden, desk... it used to belong to the last Mayor of the Royal Free City of Podgorze. A building with an extraordinary legacy. This chemists was owned by the only Aryan who was permitted to live in the ghetto, Tadeusz Pankiewicz. It soon became a bastion of the resistance movement, and of course an invaluable source of medical aid in those horrendous times. A small exhibition chronicles this era. A must for those interested in aviation - and of course air combat in the Second World War, in which the Poles played a key role. A large range of fighter planes from the early twentieth century including the German Albatross BIIa, Spitfire and the Soviet Kakuruznik. An entrancing place - once firmly in the countryside but now (sadly) almost merged into the suburbs and reachable by tram. This little manor house, which houses the museum of Young Poland, inspired one the country's best loved plays, The Wedding, by Stanislas Wyspianski. It is still owned by the family that hosted that wedding, and it's an absolute gem. Many fine paintings and rich in magic and wistful reverie. Great site, useful information. We are coming to Krakow from Toronto in a few weeks. We are really looking forward to visiting your beautiful city for the first time. The museums are definitely improving. Just visited the city after an 8 year break and I must say all the museums are much better organised, friendly and well laid out. I especially liked the Ethnograhic Museum. The Polish costumes are just amazing. A great source of information about the city - you guys are kinda like a mini Wikipedia about Cracow - I keep finding more and more pages on the site. Well done! The air museum is my favourite, but in things considered Krakow has a really good group of museums for such a small city. You have to dig around a bit though to find some of the smaller jewels. This is a good page, and seems to have most of the best ones covered - well researched!